Students read about how acid/base balance affects a person's health. This activity includes animation. Learners view video clips demonstrating acid-fast staining procedures. Correctly stained slides are shown. The learning object includes two matching exercises. Students read and test themselves on the conditions that cause specific acid/base imbalances. 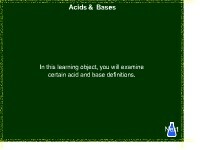 In this interactive object, the learner matches various disorders to the acid-base disturbances they cause. Students read different definitions of "acids" and "bases." In an interactive exercise, they identify if a substance is an acid or a base. Learners view several movie clips that demonstrate the use of an indicator to follow the neutralization reaction that occurs when an acid and a base are mixed. Students test their knowledge in a series of questions. Immediate feedback is given. Through the use of symbols and words, the learner reviews the etiologies, symptoms, and treatment of respiratory and metabolic acid-base disturbances. 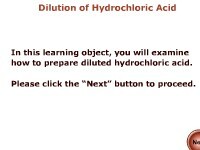 In this interactive object, learners examine how to properly dilute hydrochloric acid. Learners view an animated presentation showing how the pH level of a cleaning solution is controlled in a closed-loop system in a manufacturing setting. A quiz completes the activity. In this animated object, learners view hydrogen and hydroxide ions in a solution. 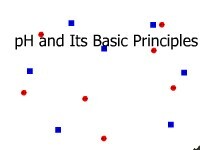 A brief quiz on the basic principles of the term pH completes the activity. 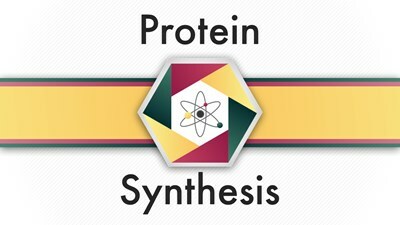 In this video, you'll review how every protein molecule of an organism is synthesized. In this animated object, learners compare the mode of action of steroids with the action of amino acid-based hormones. Students read about the process of hair growth beginning with the joining together of amino acids.